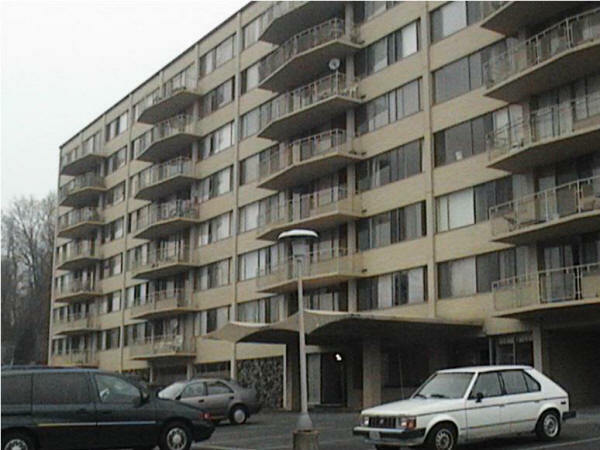 The Palazzo Condominium complex is located in Arlington County, Virginia. Its watershed, Four Mile Run, is considered to be a high priority, seriously impaired watershed in the most urbanized area in Northern Virginia. Approximately 85% of the watershed's land has been developed with nearly 40% of its cover impervious. Large residential buildings like the Palazzo are typical and increasing in number. During the initial development of the Palazzo area, stormwater controls were very limited and inefficient. Throughout Northern Virginia in these older developments, we find stormwater management to be below current standards and in serious need of renovation. Applying low impact development techniques as retrofits could provide a means to reduce stormwater runoff in these older communities. In 2005, LANDS and WATERS partnered with the Palazzo community and Building Logics to construct a 12,500 sq. foot green roof to reduce and filter stormwater runoff, reduce energy cost, and to increase the longevity of the roofing system. The project was designed to focus on the stormwater issues in the Four Mile Run Watershed. By addressing these problems the community became a demonstration site for the use of low impact development as a retrofit on an older high rise building. Funding was provided by The National Fish and Wildlife Foundation and the Palazzo community. The Palazzo condominium is a seven-story, 35 year old high rise standing on a 1.2 acre lot in the heart of the highly developed Four Mile Run Watershed. The Palazzo roof-top was planted by volunteers. Roof-top one year after planting. The Palazzo has an extensive green roof system. These systems are light weight and planted with low growing vegetation. The plants most often used for rooftop plantings are sedums, a succulent that can tolerate the extreme conditions found on roof-tops. Twelve different varieties of sedums were planted on the Palazzo roof-top. 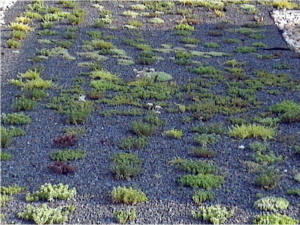 The vegetation is the last of several layers that make up the components of the green roof system. 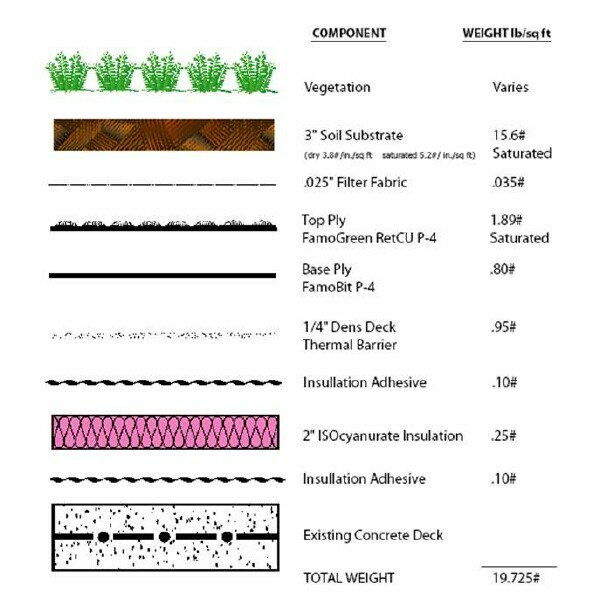 Elements used to construct the Palazzo green roof. The current studies being done on the effectiveness of green roofs for reducing stormwater runoff are encouraging. According to one study in Seattle, a green roof has the potential to lower stormwater runoff from 65 to 94%. For cities like Washington D.C. that have a combined sewer system, this could significantly reduce the demands placed on wastewater treatment plants during storm events.